There's nothing quite like twinkling holiday lights to make you feel the spirit of the season. In San Diego County, there are many neighborhoods that go all out for the holidays, creating dazzling displays for all to enjoy. Here's a look at a few of those must-see neighborhoods. "Belardo Lights," tucked in Tierrasanta at 5306 Belardo Dr., between Camino Playa Catalina and Callejon Quintana, boasts a dazzling computerized Christmas lights display. This year, the lights are up through Dec. 27, from 6 p.m. 10 p.m. nightly, synchronized to festive music played on 106.1FM. This display, running since 2006, is hosted by Randy Schimka. 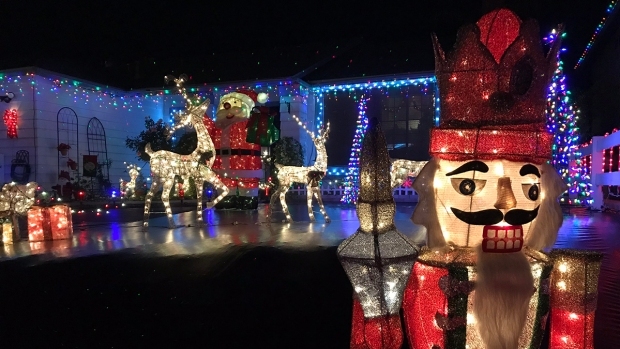 It was inspired by his son, Brandon, who has Autism and, as a youngster, was very interested in the lights and decorations around the neighborhood. The father and son duo work on the lights display together year after year. "Jingle Bell Hill," also known as "Pepper Drive Lights," features dozens of homes decked out for the holidays. This El Cajon neighborhood is nestled off State Route 67 and Pepper Drive and can be accessed from two areas: Pepper and Rockview drives (west entrance) or Pepper and Lindenwood drives (east entrance). If you can't physically make it to Jingle Bell Hill this year, here's the next best thing: a livestream of the neighborhood lights can be seen here. Located just off State Route 67 at 10248 Paseo Palmas Dr., Lakeside's "Tinsel Town" will be going strong this year with lights galore. Stars and strings of lights connect the rooftops of this neighborhood to one another making this little community quite unified. The lights are on from 5 p.m. to 10 p.m. nightly. In Santee, this massive lights display known as “Starlight Circle” draws crowds year after year. Located on East and West Glendon circles off Magnolia Avenue, visitors can see elaborate, handmade Christmas displays spanning dozens of homes. Many of the displays follow a theme – from “Star Wars” and superheroes to “Toy Story” and “Sesame Street.” Sometimes, the residents will sell hot cocoa, kettle corn, cookies and other holiday treats, for visitors to enjoy as they stroll the neighborhood. The lights are usually on from 5:30 p.m. to 10 p.m. nightly. Also in Santee is “DB Christmas,” a dazzling display created by Michael Balazs each year at his home at 9773 Roe Dr. The lights – in honor of Balazs’ late father, who died from cancer in 2009 – include thousands of multi-colored strings, spiraling Christmas trees, lawn displays that read “HOPE” and “CURE,” and even holograms of Santa Claus projected on the windows of the home. Balazs’ display is synced to holiday music played on 98.5FM; he collects donations from spectators to support charities such as St. Jude Children’s Research Hospital on behalf of his father. Balazs said he gets his holiday cheer from his dad, who loved Christmas. These lights are on nightly from 5 p.m. to 10 p.m.
A San Diego favorite, Christmas Card Lane in Rancho Penasquitos typically runs nightly from dusk to 10 p.m., through New Year’s Eve. The holiday lights can be seen lining homes on Ellingham, Oviedo and Renato streets off Black Mountain Road. This is a neighborhood where you’ll want to take your time admiring the lights. 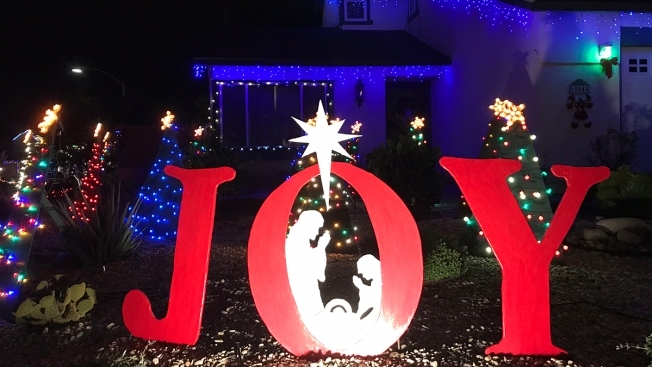 Boasting lights aplenty, this jolly display in Poway runs down part of Stoutwood Street, near Brookstone Drive. Some homeowners set up bonfires and little stands on their driveways selling hot cocoa, cookies and popcorn as visitors stroll through the area. Over in the South Bay, the must-see holiday attraction is Christmas Circle. For six decades, residents on Whitney and Manakato streets, between First and Second avenues and south of H Street, have decked out their homes in bright lights and pretty decorations. The free displays are powered up nightly from 5 p.m. to 10 p.m. and usually stay put until a day or two after Christmas. Each year, Carmel Mountain Ranch also spreads holiday magic of its own via Fairway Village, a neighborhood located on the east and west sides of Stoney Gate Place. There, around 80 homes are decked out in Christmas lights through New Year's Day. Visitors will sometimes find residents playing holiday movies outside, carolers and dancers. On the Saturday evening before Christmas, this neighborhood typically holds a block party featuring hot chocolate, cider, music, lights, cookies, snacks and more. Santa has also been known to make an appearance -- depending on the workload at the North Pole, of course. This display, located at 1639 Knob Hill Rd. in San Marcos, has been lighting up the North County neighborhood since 1988. Over the decades, it has grown to more than 85,000 lights, powered up nightly through Dec. 30 from 5 p.m. to 9 p.m. Visitors will also see 100 plastic holiday figures, 80 snowmen and 100 candy canes, to name a few of the bells and whistles. Santa Claus visits Knob Hill each year and, this season, he’ll be there from Dec. 14 through Dec. 23, from 6:30 p.m. to 7:30 p.m., listening to Christmas wishes and spreading cheer. Built in 1905 for Mayor John Forward Sr., The Forward House in Bankers Hill houses a business called American Security Mortgage Company. Each holiday season, the large home located at First Avenue and Ivy Street turns into a Christmas bonanza, decked out in endless lights and decorations. The magic shines through New Year’s Eve. Over in Point Loma, off Rosecrans and Garrison streets, locals will find the Garrison Street Lights display. Filling a block with festive décor, the display typically runs nightly through New Year’s Eve. There you have it: a small sampling of some holiday displays lighting up San Diego County this season. Did your favorite festive neighborhood make the list? Share details of your favorite spots for these types of displays in the comments thread below. Happy Holidays!